Chad (Old English: Ceadda; died 2 March 672) was a prominent 7th century Anglo-Saxon churchman, who became abbot of several monasteries, Bishop of the Northumbrians and subsequently Bishop of the Mercians. He is credited, together with Cedd, with introducing Christianity to the Mercian kingdom. Chad was one of four brothers, all active in the Anglo-Saxon church. The others were Cedd, Cynibil and Caelin. 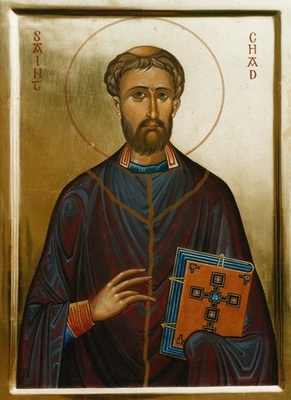 The only major fact that St. Bede writes about Chad's early life is that he was a student of Aidan at the Celtic monastery at Lindisfarne. In fact, Bede attributes the general pattern of Chad's ministry to the example of Aidan and his own brother, Cedd, who was also a student of St. Aidan. Icon reproduced with by permission of the iconographer, Aidan Hart.